You want some free cigars? Of course you do! Go take some free cigars from Tony’s humidor, he’s giving them out at this link! Tonight I’m revisiting a cigar I got as part of a Mobster Movie blind review series not too long ago. 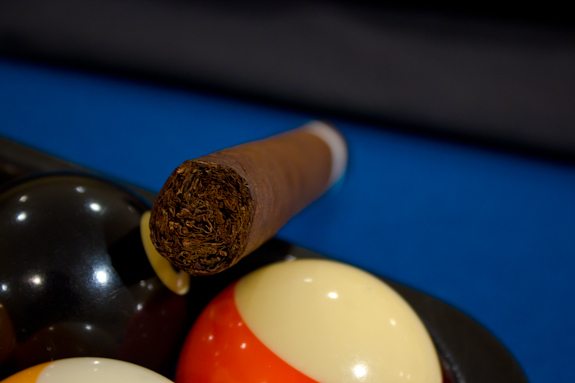 If you take a look at that review you’ll see that I wasn’t overly impressed with the cigar. After talking to a few people it seems there are some mixed feelings about the Illusione ~mj12~ and I wanted to give it a full out review to see if my experience would be any different. So here it is finally, I made sure to let the ones I have rest and acclimate properly before this review since the blind stick might have been a little fresh from transit. 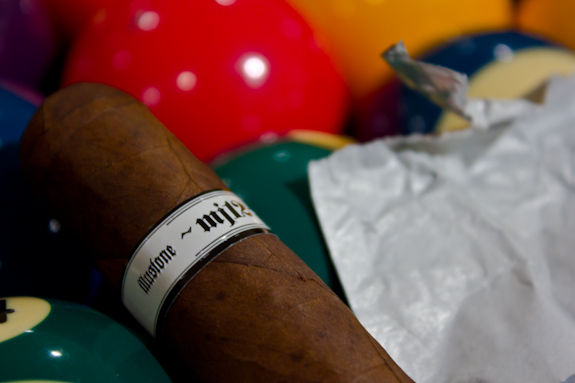 So after smoking a few more I’m lighting up one of the Illusione ~mj12~ cigars for review tonight. Now I’m a pretty big Illusione fan and I’ve also enjoyed a few of his other lines including the Cuchillos Cubanos and the Cruzado’s (Tony actual posted a review of the Cruzado Dantes awhile back). In case you didn’t know, the person behind the Illusione brand is Dion Giolitto. We also have a few reviews up for the Illusione line such as the ~88~, ~888~ “Slam”, Epernay Le Elegance, ~mk~, and Singulaire Phantom. Now you’ll see from those posts that both Tony and I really enjoyed the cigars. Knowing that, I have to admit I’m coming into this review with mixed expectations. I have high hopes due to other Illusione’s I’ve enjoyed but I also have concerns because of my experience with the blind version of the ~mj12~. So of course I started scouring the web to see what else I could find cause I love learning more about the sticks I review. What I did find was somewhat limited but still interesting. 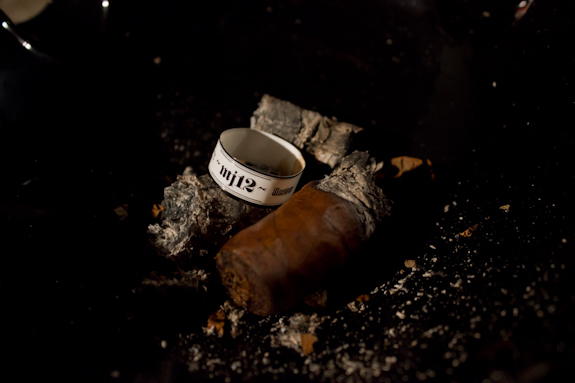 The cigar is a Nicaraguan Puro and the specific seeds used are Corojo ’99 and Criollo ’98 finished with a Cafe Colorado wrapper. 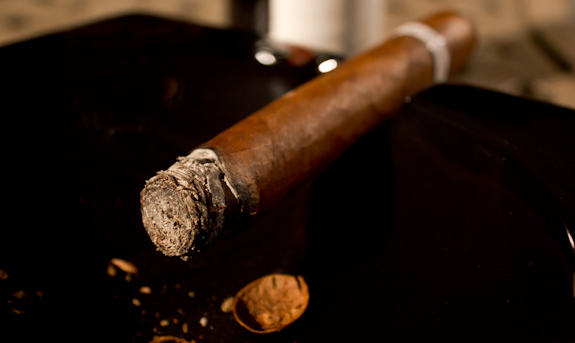 Each of the cigars is also handmade in the Raices Cubanas factory which is located in Nicaragua of course. 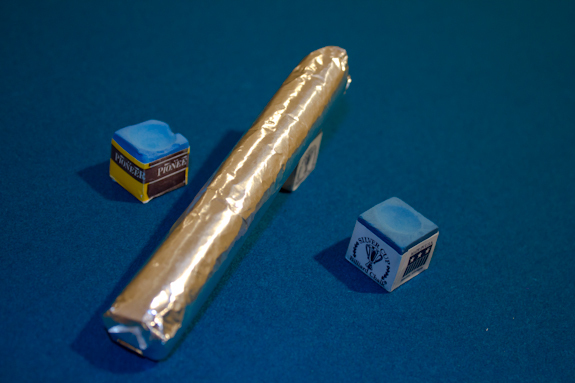 The cigars come in boxes of 20 and are surrounded by an interesting silver foil wrapper. Warning: You are supposed to remove the foil before smoking! 😀 Wanted to get that out there just in case, you never know sometimes! Now being the little investigator that I am, I curiously typed “MJ12” into Google and came upon an interesting Wikipedia article. Apparently, “MJ12”, or “The Majestic 12” is “the alleged code name of a secret committee of scientists, military leaders, and government officials, supposedly formed in 1947 by an executive order of U.S. President Harry S. Truman”. Now I’m not one for conspiracy theories or anythign so I’ll leave it at that, but interesting nonetheless! Let me start by saying I REALLY wanted to enjoy this cigar. It has a wonderful visual appeal to it and I’ve enjoyed mostly every Illusione I’ve had. Sadly though the ~mj12~ yet again failed to meet my expectations. I know it has potential though, the profile when I wasn’t relighting was pretty tasty. And the retrohale was very enjoyable. 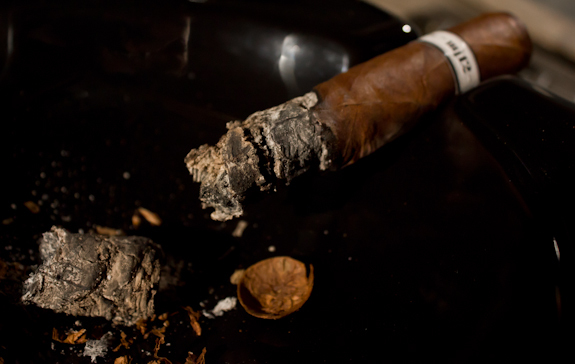 It’s the terrible burn that lost all the points on this cigar. It made it difficult to enjoy and ruined the flavors for the first couple draws after a relight. If I had this cigar without burn issues I probably would give it a glowing review but I’ve smoked through about 5 of these from different batches and I had the same issues every time. Maybe it’s just my luck cause I know a lot of people really enjoy them, but for me, I’ll stick to other vitolas in the Illusione line before looking at these again. On the flip side, I happened to discover a wonderful wine last time I took a road trip to Niagara. The Southbrook name was actually a farm not far from my house many years ago. They used to do the typical fruits and vegetables with awesome fresh baked pies and a hay maze for the kids in the fall. Pumpkin picking too of course! When they closed the farm they opened a winery out in the Niagara region so I had to visit them. The wine I’m pairing with tonight is from 2006 and is a blend of a Cabernet and Merlot, which are 2 of my favorite wines from this region. It has a fantastic smooth flavor to it and a nice medium body. It’s got a surprising amount of fruity notes, in particular I’m getting black cherries and blackberries mostly. It also has a smooth oak finish to it from the barrel aging process that comes through very nicely. 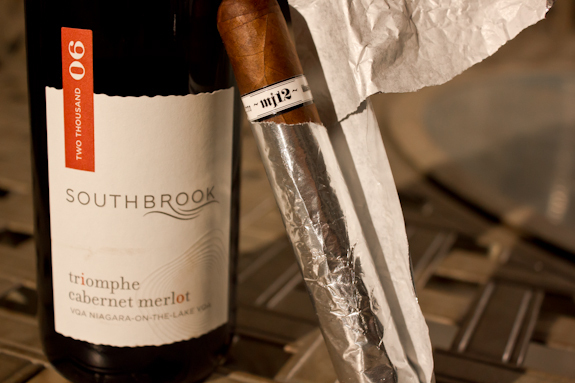 This is a great cigar pairing wine and would hold it’s ground against a variety of medium and full bodied smokes. It did very well with the Illusione ~mj12~. 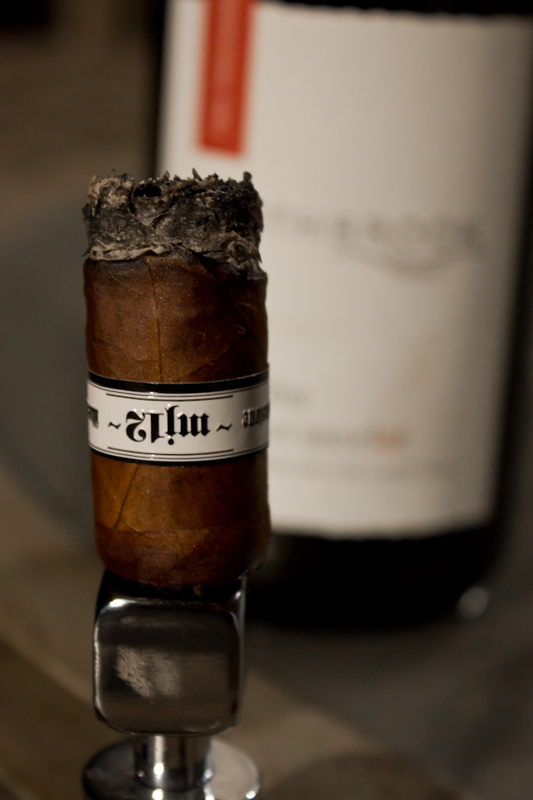 Other pairings with this cigar could be a coffee with milk, an brown ale and of course, Port! GO FLYERS?!?! GO…FLYERS?!?!?! coughcough GO DEVILS!!!!! hahah sorry man I’m a huge hockey fan and even a bigger Devils fan (hockey fan in the desert, yes I know, strange). I actually like the Flyers a lot too. Just not tomorrow ;p It’ll be a good game though. The Flyers look VERY good this year, and I am just hoping we can do more damage then the crappy year my Devils had last year. PS. Daniel is a Pens fan. He thinks Cindy Crosby is “dreamy”. Well Tony how do you like them Flyers now!!! hahah Shut out!!!! hahaha, I never said I didn’t like the Flyers 🙂 They are one of my top teams actually, just not when they play the Devils. We really have a hell of a lot to make up for and I am just hoping we can get into the swing of things early. As for the Flyers, now that they have good in-goal presence they are going to be one of the teams to be this year. I expect to see them make it VERY far. Thanks Czerbe, glad I’m not the only one with this problem. Hmm. Humidity issue? Maybe that foil wrapper isn’t allowing the cigar to breathe properly? Whatever it is, it doesn’t sound like much fun. Too bad we don’t get much in the way of Canadian wines here. Protectionism for Washington state wineries, I guess. About all you see are ice wines. Brooks from Smoking stogie will be on Kiss my ash radio saturday morning at 10 am.I cant wait to hear the show. I thought the foil might be a problem too jjo, but the blind one I had in the Mobster Series didn’t have any foil on it and it was sitting in my humi for a few weeks. The results were the same so I guess it didn’t have any bearing on the end results. I’ve had a few Washington wines and some are very good, but I like to support my locals :). The Ice Wines are good but you can only have so much of them, super sweet. Try and find some Niagara wines if you can, they are very good. Now I am a self procclaimed illusione junkie and of all the vitolas and labels… The -mj12- is my least favorite. I would rather smoke a -nostoros-…. The stick is just too big and muted for mwe to enjoy. I really really love Dion’s work, I just think there is too much filler and it really takes away from the flavors, I smoked one thispast Wednesday and it did burn pretty straight. However I would much rather smoke an -mk- or -88-….Thanks D! Totally agree with you Tadd! Now that you bring up the Nosotros I still have one left over, I may have to spark it up soon to see if age did anything good for them. 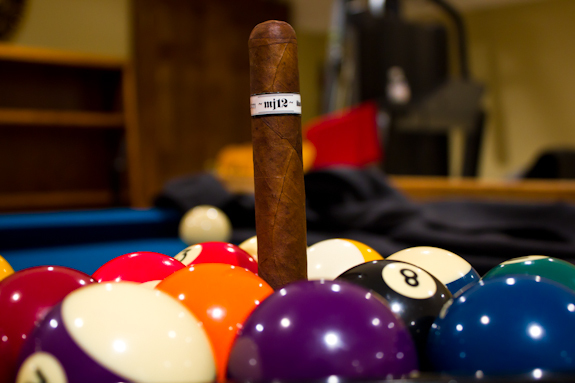 ~88~ and ~mk~ are two of my favorite smokes, this vitola just doesn’t sell the Illusione line very well. Illiuaione 88’s are the first boxof cigars I ever bought. Tough to follow up that bar they amset for value/quality! Love photography # 3. Good job ! MJ12, decent but not as special as other describe. I take Epernay, MK or CG4 over MJ12 any day. 88, 888 were decent. Need to smoke through other at some point. I had similar issues with needing to relight the cigar so I asked my friend Chris at Heroes & Legacies here in Austin about it. He suggested removing the foil and waiting at least half an hour before smoking it. The foil has a negative effect. I know that your first MJ12 didn’t have foil but, in my case, I’ve had no problems since letting it breathe before lighting it. Also, the maduro is far superior, imo, than the other two MJ12’s. 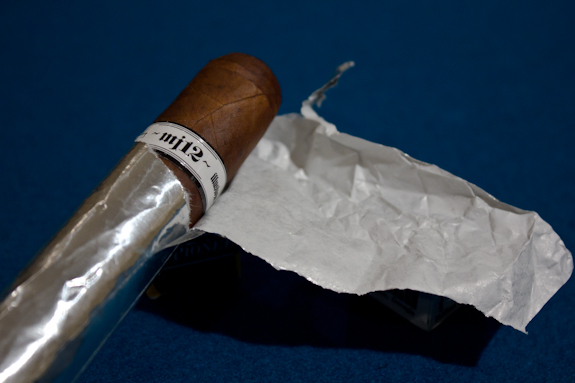 Also, I wondered why Illusione put foil on the MJ12 when none of their other cigars have it. It turns out that it’s a tip of the hat to the whole Majestic 12/Roswell Area 51 story behind the name… the tin foil hat people.